Gropper was fascinated with American folklore, and figures such as Johnny Appleseed, Paul Bunyan, and Daniel Boone became subjects for his art. 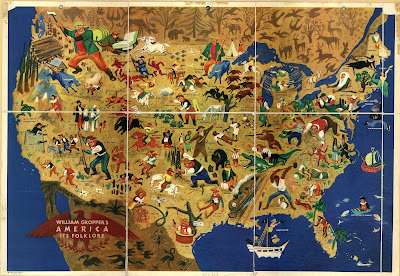 In 1946, his painting of a map entitled William Gropper's America: Its Folklore was published and distributed worldwide through the U.S. State Department. Senator Joseph McCarthy, chair of the Committee on Government Operations, believed the map was inspired by Communist ideas and consequently subpoenaed Gropper to appear before the Permanent Subcommittee on Investigations in May 1953. Invoking the Fifth Amendment, Gropper refused to answer any questions and was subsequently blacklisted.